HELSINKI â" The summit between U.S. President Donald Trump and Russian President Vladimir Putin will be held at one of the Finnish presidentâs official residences in Helsinki, a palace that overlooks the Baltic Sea where the presidentsâ predecessors have met, officials in Finland said Friday. 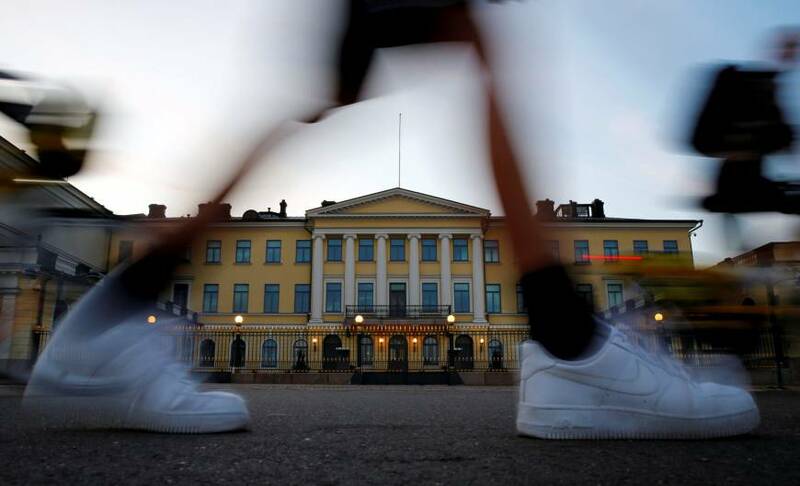 The office of Finnish President Sauli Niinisto said Trump and Putin would meet on Monday at the 19th century Presidential Palace, located a stoneâs throw away from the capitalâs iconic waterfront Market Square. Putin and Trump have met twice before on the sidelines of international meetings. The Helsinki summit will be their first official stand-alone meeting. U.S. President George H.W. Bush and Soviet President Mikhail Gorbachev held talks at the same venue in 1990. Trump and first lady Melania Trump are scheduled to start the day joining Niinisto and his spouse, Jenni Haukio, for breakfast at Mantyniemi, another presidential residence in Helsinki where the couple lives most of the time. Niinisto also will hold a bilateral meeting with Putin. Finland, a Nordic nation of 5.5 million, has a long legacy of hosting U.S.-Soviet and U.S.-Russian summits due to its geographic location and perceived neutrality. The last time a summit brought presidenti al entourages from Moscow and Washington to Helsinki was in March 1997. U.S. President Bill Clinton and Russian President Boris Yeltsin held talks on arms control and NATO expansion. U.S. Marine Corps Gen. Joseph Dunford, chairman of the Joint Chiefs of Staff, met with Gen. Valery Gerasimov, the chief of the Russian militaryâs General Staff, in a manor house owned by the Finnish state in June to exchange views on U.S.-Russia military relations, Syria and international security. Along with the two leaders, U.S. Secretary of State Mike Pompeo and Russian Foreign Minister Sergey Lavrov are set to meet at the Presidential Palace on Monday. Researcher Sari Autio-Sarasmo at the University of Helsinkiâs Aleksanteri Institute said the Finnish capital and Vienna were important conduits between the East and the West during the Cold War. While both European cities were centers of espionage, Helsinki specialized in relaying information and acting as a go-between for the worldâs two superpowers. âAs a member of the European Union, Finland doesnât anymore emphasize its neutrality, but strong expertise, particularly on Russia, and good location make Finland a very useful meeting place,â said Autio-Sarasmo, who specializes in studying Cold War history. Finland joined the European Union in 1995, but has remained outside of NATO as a militarily non-aligned nation in a similar way as Sweden. The 3,000-square-meter (32,292-square-foot) Presidential Palace, which underwent a major renovation completed in 2015, has also hosted prominent nonpolitical guests during its eventful past, including Britainâs Queen Elizabeth II and the late (now a saint) Pope John Paul II. It was built for a wealthy Finnish merchant in the early 19th century on grounds that formerly held a salt store house. After Finland was integrated into Russiaâs Czarist Empire as an independent Grand Duchy in 1809 after being part of the Kingdom of Sweden for nearly 700 years, the building was completed in 1845 at the request of Emperor Nicholas I and became the Imperial Palace. During World War I, the grand residence temporarily housed a military hospital. Following Finlandâs independence from Russia in 1917, it was officially renamed the Presidential Palace in 1921. The palace now is the working residence of Finlandâs president. It currently houses the Office of the President and is the venue for official events.